Home / breaking news / Other / Picture Of A Man? Nope… Zoom In And You’ll See What’s Hidden. UNBELIEVABLE! Picture Of A Man? Nope… Zoom In And You’ll See What’s Hidden. UNBELIEVABLE! One of the best ways to take a look at things from a different perspective is through art. It can take us to new worlds, different points in time and can even show us things we’ve never even thought of before. That’s exactly what makes art great though, that no two pieces will be exactly the same, even when they look similar. 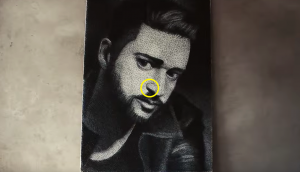 This piece of art for example, doesn’t use crayons, pens, paints or anything of the likes, this particular picture was actually made using a pencil, thread, a hammer and some nails! Done by Zenyk Palahniuk, a Ukrainian artist that spent around 200 hours on this incredibly beautiful piece with over 13,000 nails and 24km of thread. Take a look at the video below for a full glimpse of the entire painstaking process, even though it’s long and drawn out, the results are well worth it.